As the ecommerce industry continues to thrive, there is greater demand on supply chains being able to store, retrieve and despatch items in increasingly shorter time frames. In order to meet these demands, it is important that retailers maximise the performance of their supply chains to ensure they are running at optimum efficiency. When evaluating performance, usually the first port of call is warehouse services and storage facilities. As the demand for a large online product range continues to grow, companies are facing pressures to increase their storage capabilities to match. This can be achieved by either upgrading current facilities or moving to a new warehouse. Of course, not only can this be a major expense, but also the process itself is potentially disrupting to businesses with the risk of causing detrimental down time. In order to reduce any downtime, it is important to find a supplier that is able to understand your facility and work with both you and other suppliers to avoid any unnecessary disruptions. Fitting out a new warehouse can be a complicated and expensive task. Whilst the major elements such as conveyors, lighting and racking may be first on the to-do list, it is critical tasks such as racking labels, overhead signs and floor line marking which are often overlooked. Initially, they may seem like small jobs, but without the right barcode labels and signage, your expensive warehouse simply cannot operate. Inotec UK offers a unique, total approach to warehouse services and can work with you to develop the best solution for your facility. Covering all aspects, inotec will create a bespoke warehouse facility fit-out for you. By working with a partner like inotec, you can guarantee that they have the necessary experience to complete each stage of the project to meet your operational start deadline. The bonus of approaching an experienced warehouse services company is that they have the knowledge to recommend the best-suited products to improve efficiencies. They also have deep understanding of the time-frames required to successfully complete this vital work. Inotec UK offers a range of warehousing labels for all shelving and racking types. The right labelling system is important, as without an efficient system, it can be difficult to locate items and keep track of stock. Working with your warehouse software team, inotec will carry out tests to ensure that there is complete compatibility between the barcode labels and your warehouse management system. Racking and shelving labels are essential to keep your warehouse running efficiently. Inotec’s range of high definition, quick scan barcodes offer consistently accurate scanning for either single location, multilevel or shelf labels. All labels are hardwearing, durable and can be colour co-ordinated to suit your desired finish. For warehouses that use containers or have automated conveyor systems which use totes, inotec has a range of durable container labels. Inotec’s range of adhesive container labels offer fast and accurate readability making them ideal for the transport, logistics and ecommerce industries. Permanent under-surface printing ensures the highest levels of scratch resistance and durability. Inotec UK also offers a range of in-mould labels where the label is bonded directly into the surface of plastic containers or totes during the manufacturing process. The bond between the label and crate becomes permanent, offering a smooth, edgeless surface. This eliminates the risk of contamination behind the label, making in-mould labels ideal for areas which require a high standard of hygiene such as the food and pharmaceutical industries. For instances when overhead or racking signage may not be suitable, inotec has developed a range of floor tags and labels. The aluminium and under surface printed polycarbonate floor labels are extremely durable and scratch resistant for longevity. Designed for both indoor and outdoor use, the floor tags are resistant to fork lift trucks, repeated washing and weathering. With a range of adhesives that can guarantee a strong bond to any surface, floor IDs are a cost effective method to increase efficiency and accuracy within the warehouse. For warehouses that require a lot of heavy fork lift truck traffic, inotec UK has a range of overhead identification solutions. Using either the Inorail or pole and wire systems, overhead signage can be designed to suit and fit the most difficult of warehouse spaces. Overhead signage is a flexible solution that can be adjusted or moved to suit warehouse requirements. With a double-sided option available, it creates a solid, stable platform for overhead scanning. For those who require barcode labels on their overhead signage, intoec also offers angled signs for long distance scanning. To further increase efficiency, inotec produces barcode labels in a retro-reflective material which improves the accuracy of scanning. The reflective barcode labels allow users to achieve scanning distances of up to 15 metres. For those who just require a simple signage system, flat signs offer a cost effective identification solution. With custom designed layouts and colours, there is an option to suit even the most restricted of budgets. Inotec UK’s line marking and floor painting systems have been developed to offer the best in durability for industrial and warehouse applications. There is a solution to match all floor types and warehouse environments, ranging from ambient and chilled to freezers. In addition to the inside of the warehouse, inotec also provides floor painting for external areas such as car parks and loading bays. Working with you to ensure minimal disruption to your operation, inotec will carry out the work around your facility and shift patterns. 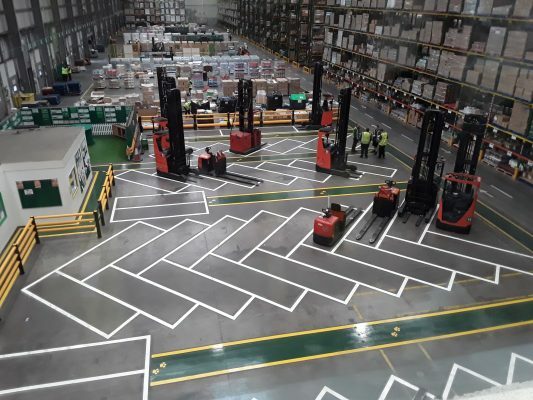 Available in a range of colours, line marking and floor painting is ideal for increasing health and safety in the warehouse by marking out walk ways, loading bays and fork lift truck lanes. For a durable solution which can be expected to last up to five years in even the busiest of warehouses, inotec UK offers a Total Rapidshield UV coating system. The UV topcoat forms an extremely durable, hard surface which can withstand heavy foot and fork lift truck traffic. Easy to keep clean, inotec’s range of floor marking solutions not only increases health and safety within the facility but also efficiency, as hazardous areas are clearly marked for workers. Choosing a full-service warehouse services supplier like inotec UK can not only save you time but also money. Capable of handling all aspects of the warehouse, inotec is experienced in designing and delivering even the most complex and bespoke warehouse projects.